This isn't a challenge on the money front, as I should come in well under $50, but the challenge will be completing on time. As a very amateur builder I spend a lot of time looking and thinking. And time fixing my mistakes. 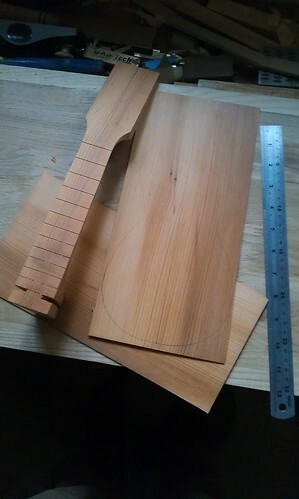 So this build will be frets direct into neck, no binding (unless the top/sides join goes horribly wrong, or it just looks unbalanced), using the 1890s body shape. 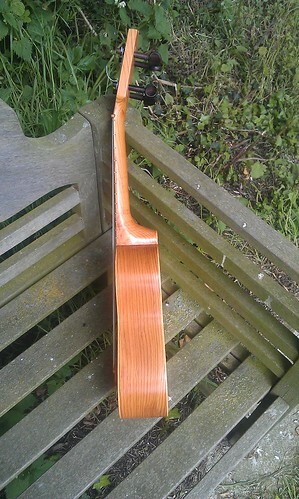 Linings rather than kerfing, one-piece bridge also in yew, rosewood friction pegs, French polish finish. A bit of a hiatus because I'd forgotten how toxic yew sawdust is. Cutting out the neck, and stroking my chin in thought, resulted in a certain amount of swelling and a fair bit of itching. No pictures, though, to spare the sensitive from pain. 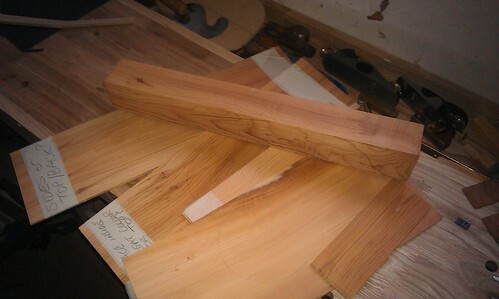 The next step is to thickness the sides to about the same, at which point I can start glueing bits together. And another break to recover from the allergic reaction to thicknessing, but over the last couple of days I'vemade some progress. 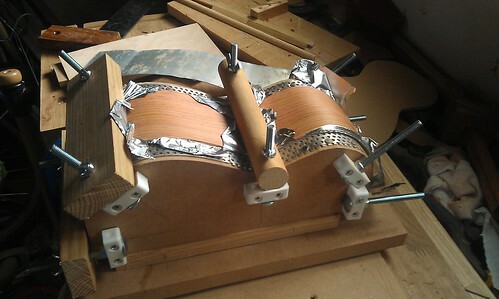 The bracing is just a rubbed joint, but note the high-tech clamping method for the bridge plate. 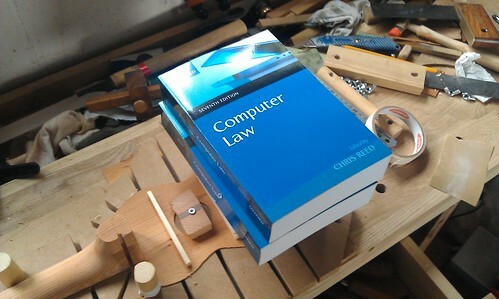 Fortunately I have several copies of this book. 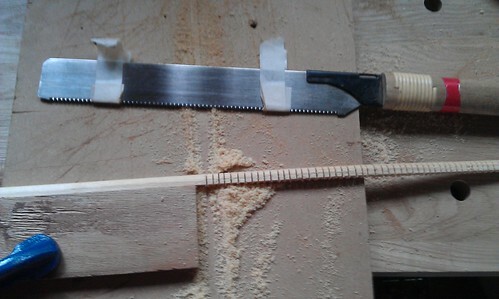 I also decided I'd need kerfed lining for the top/sides joint because of this method of construction, so I made the kerfing from a piece of beading from the DIY shop, using the kerfing attachments for my pullsaw (about 5 layers of tape is about right). With any luck I can make time this week to attach the sides, but I can't close the box until we get some dry weather as I have no humidity control. Once it's closed up, I might just be able to sprint and make the 31 May deadline. Made some progress over the last few days. 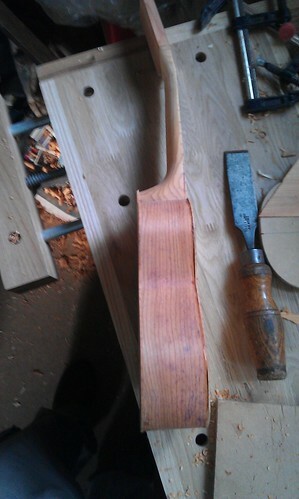 Once the glue was dry, I had the job of tapering the sides from 2.5 inches at the tail to 2 inches at the heel. And now the scary part, as I cut along the line. I try to saw on the tape itself, which slightly reduces the risk of splintering. Phew! It went OK, and I managed not to destroy the cut-off part which will make the linings for attaching the back. !0 minutes with a block plane and some sandpaper stuck to a block of MDF and I have a nice, level surface. 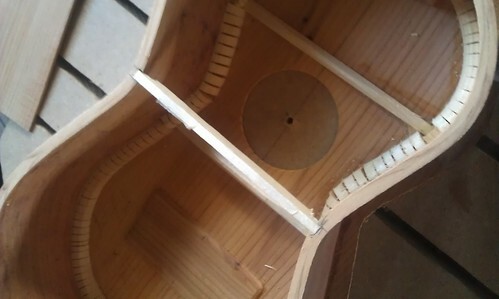 Both front and back are completely flat, which makes constructing the box very much easier. 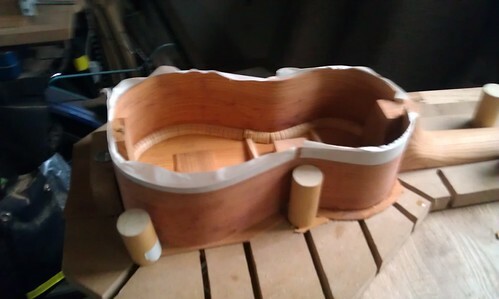 The next step will be to glue in the back linings, make the single back brace, and then close the box. But we've had damp weather for the last 10 days or so - I'll get all ready, but need some dry days if I don't want the thing to crack and fall apart! The weather forecast is for the humidity to drop from the 80/90% it's been for the past week to 50% tomorrow and maybe 47% on Sunday afternoon. So, that's when the back will go on. I've now got it ready to that stage. 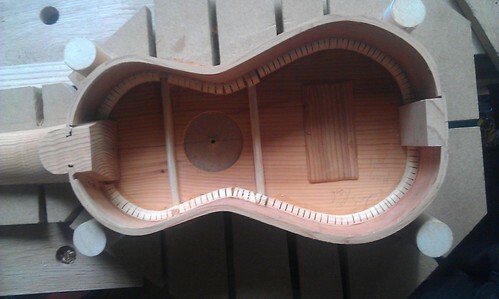 Note that I have cunningly removed the screwed in block over the soundhole. This really helps to keep the top flat while I glue the sides on, but it would be really embarrassing for it still to be there after the glue has set on the back! 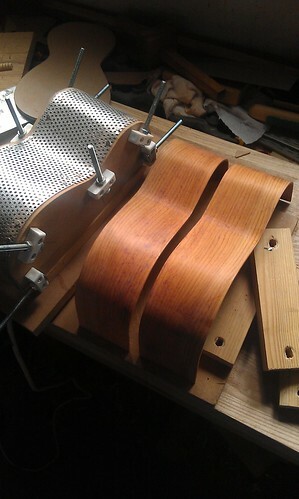 Next I notch the linings for the back brace. 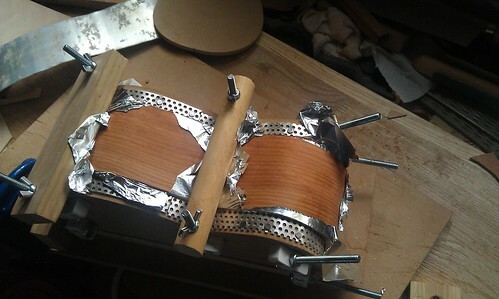 I had a cunning idea, and put the brace in place with a couple of scraps of double-sided tape on its base. Position the back, press down, and hey presto the brace is in the right position. Pencil marks, remove tape, and then glue. Tomorrow while the humidity drops I will go and fly my glider, and then Sunday is box-closing day. Hit the low humidity window and got the box closed up. 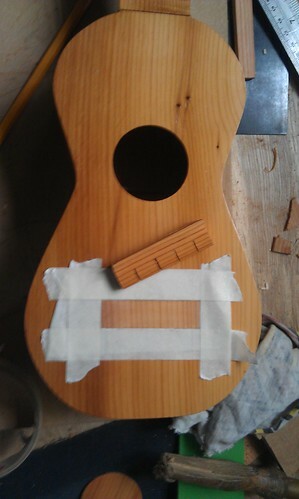 Plenty of sanding to follow (no pictures of that 'cause it's far too dull). There's a real risk I might make it by the deadline. 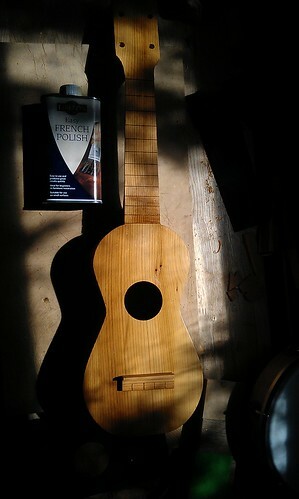 After scraping and sanding I've been able to get a few coats of pre-made clear French polish on, so it's starting to look like an instrument at last. The finish would more properly be described as rubbed shellac - I've wiped on about 6 coats, and these will be gently rubbed back with wire wool and then wax polished. I'm looking for a sheen, rather than full gloss. 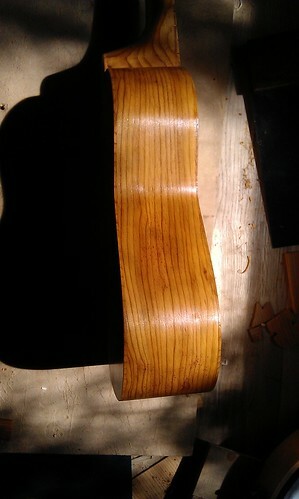 The bridge is not glued on in those pictures, but today I was able to mark its position and scrape away the finish. 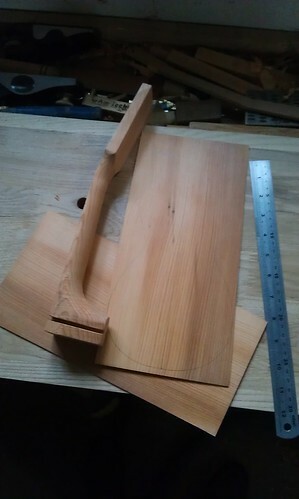 The integral saddle part will be 1/2 to 1/3 its current height once I've done the setup. 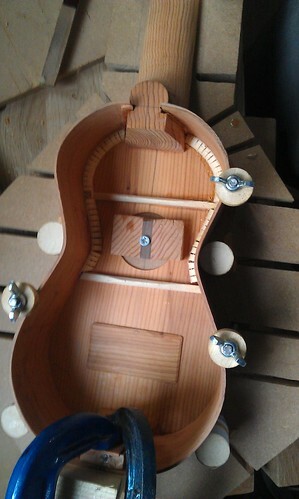 There's enough width to tweak the intonation, not that soprano ukes really have much precision in that department. 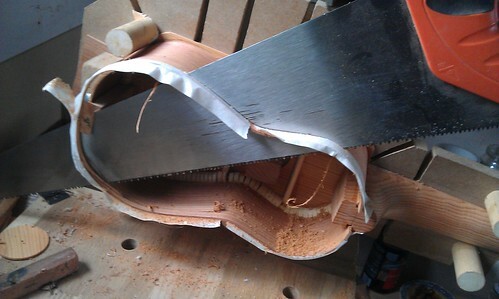 Strings are simply knotted, and the knots sit in the widened parts of the saw-slots, which I pared out with a chisel. 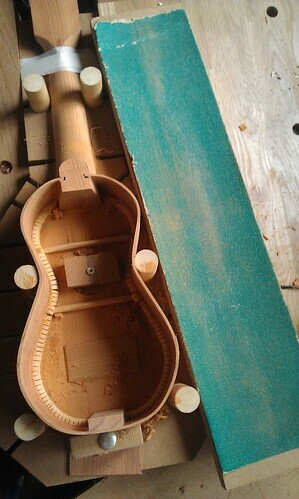 I've also drilled out the tuning peg holes and taken them to size with a taper reamer. Assuming the bridge stays in place (!) 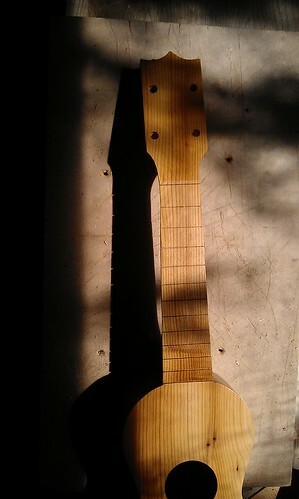 I just have to fret the neck, and then I can put some strings on and see how it goes. There should be enough time at the weekend for this, so fingers crossed. And I'm done! With time to spare, which I didn't expect. 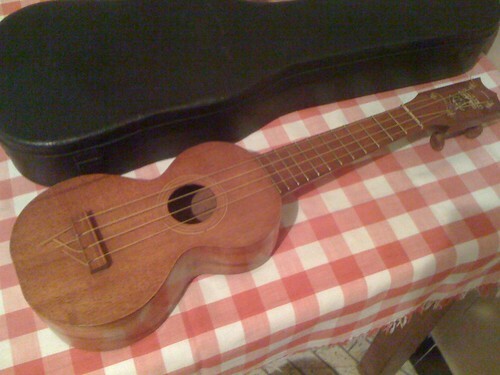 We have finish (to my usual slapdash standards), strings, and it plays. I recorded this the moment it would stay in tune long enough, but in the few hours since it's already started to open up. 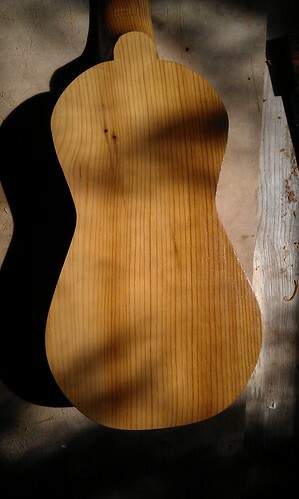 Rounder tone, more sustain. If I get the chance tomorrow I'll try to do a video. Once it's been played for a week or two and settled down I'll do the final tweaking. The action is a little too high (about 3.5 mm at the moment), which simply requires lowering the whole bridge profile (current "saddle" portion is about 3mm or 1/8 inch, so a little more needs to come off all the top surfaces). 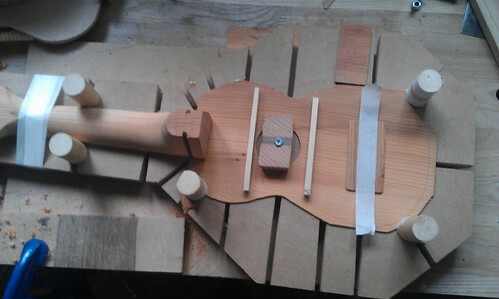 The intonation is very close, and once I have the action right I can tweak it by angling the saddle portion of the bridge. 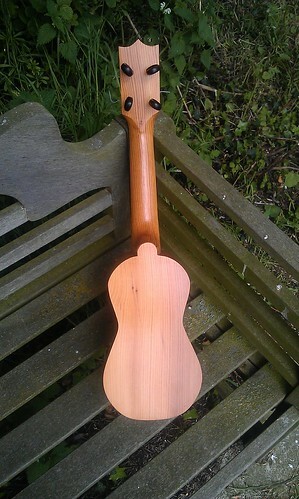 Soprano ukulele in English yew, 13.5 inch scale, frets direct in neck, zero fret. Bridge and "nut": Yew. 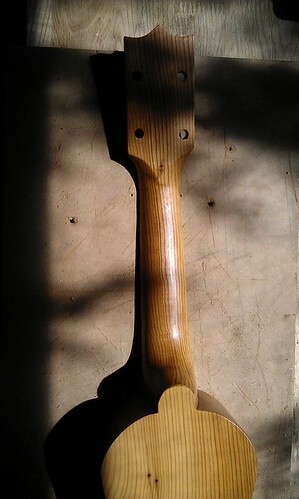 The "nut" is a three-ply yew laminate, as I know from experience that a single piece of wood tends to lose its edges in playing. 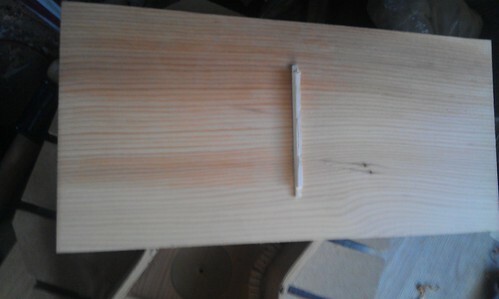 The yew and pine are local; the rosewood pegs and the (probably ramin) beading I used for the top/sides lining are imported, but they're less than 5% by weight of the whole. At today's exchange rate (according to Google) this is a grand total of US$ 33.94. Can't work out how to change the thread title to "Completed" - is this something for the mods? Congratulations Chris! 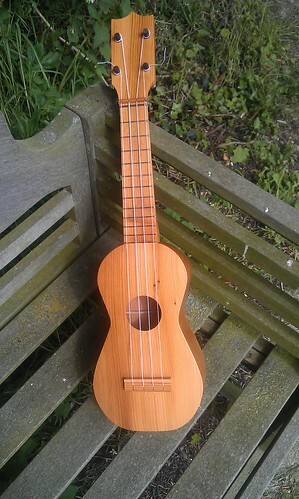 What a sweet sounding little uke. And your not half bad either. No you don't have to count strings as per the rules. Nice- it looks great! 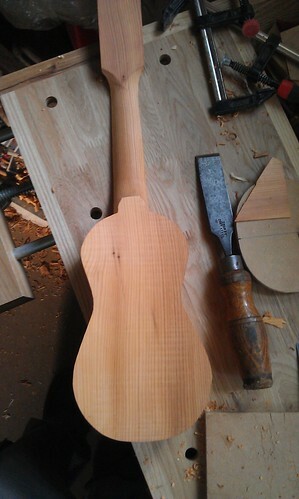 Yew is a nice wood- perfect for ukes too! Tristan. 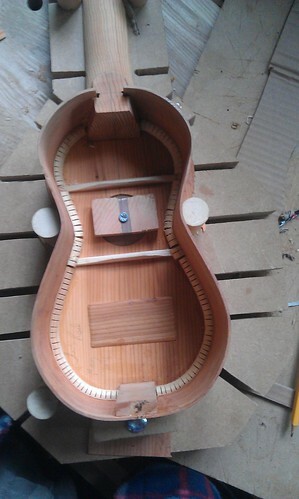 I've been watching your build, and you can't spare the time to look at my uke! 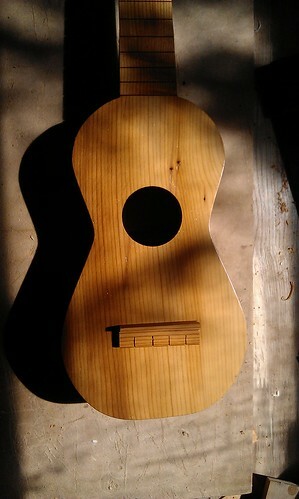 But yes, they're good fun (not like a guitar to build, much lighter overall). 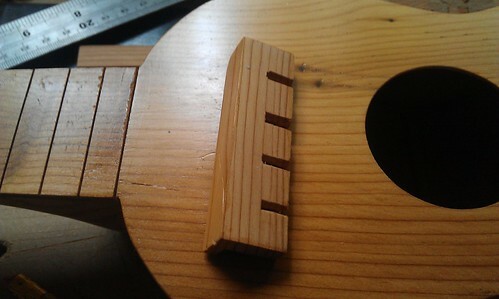 1.8mm is just about light enough (unless you have a cedar or spruce top in which case maybe 2mm), blocks and linings as tiny as you can manage. 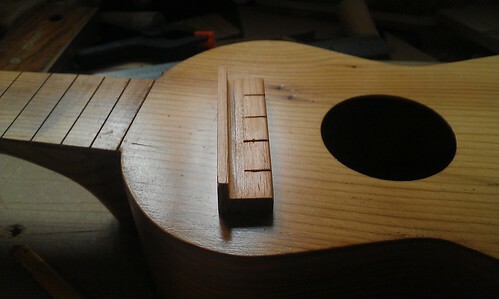 For a soprano, bracing dimensions might be 6mm x 12mm (1/4 x 1/2 inch). Skilled builders might make them even lighter - my 1920s Kumalae comes in at a mere 240 grams, or 8 oz as near as dammit! 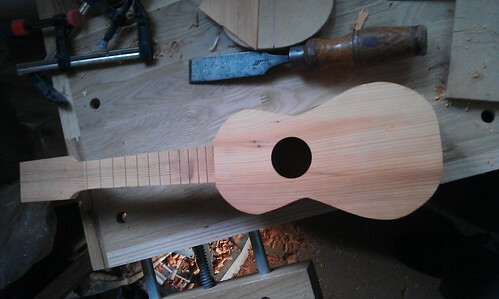 This one is around 320 grams as yew is denser and I've made the neck fairly chunky (on purpose, as I'm liking thicker necks at the moment), but my lightest build is around 270 grams. 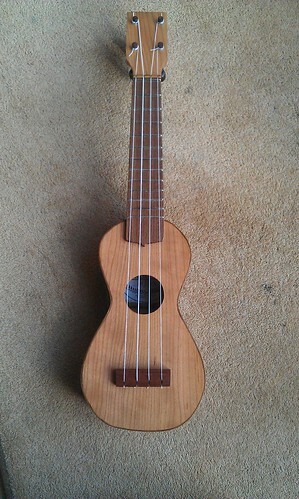 Here's the threatened video, though it doesn't show the uke as well as the pictures above. Chris Reed wrote: Tristan. 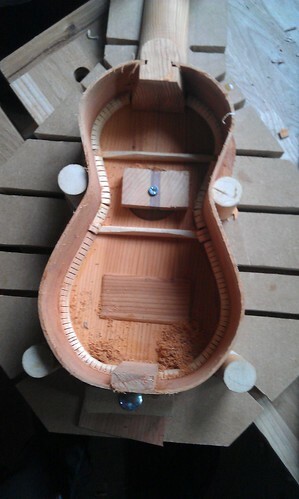 I've been watching your build, and you can't spare the time to look at my uke!